This is java3d.org. 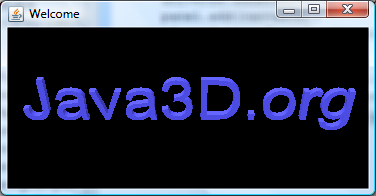 A site for demonstrating and sharing information about Java 3D, the extension to Java for displaying three dimensional graphics. You can start to learn Java 3D from the tutorial (also available en Francais and Czech), or you can look at our examples and explore our virtual worlds. Java 3D version 1.6.0 has been released and you can find it at: jogamp. More details from Julien Gouesse can be found at: Java 3D is Back. It may still be a bit buggy, so consider adding System.setProperty("sun.awt.noerasebackground", "true"); to all your programs. A nice Java 3D boardgame: Connect4. The first of dozens of virtualized traditional games. Another book, Killer Game Programming in Java has been published. It has an excellent section on Java 3D. CyberVRML97 - a loader that can import 3D objects in various formats: wrl, x3d, 3ds, dxf, obj and nff. Try the 3D Rubik's cube with pictures android game. Please don't hesitate to contact us with suggestions, graphics or example code for this site. Java 3D and Java are registered trademarks of Oracle.